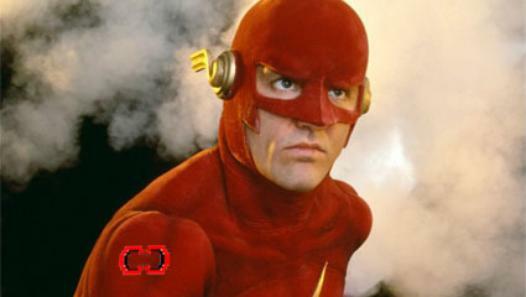 After finishing a fantastic three episode build-up of the season 2 finale ARROW, my next mission was to start THE FLASH. Anyway, once that was explained I knew I was back on track and the pilot episode did not disappoint. A different tone to ARROW which I welcome, especially if I'm going to be jumping between episodes. This kinda reminds me of SMALLVILLE in that there's many bright colours as well as having the possibility of freaky people with powers, all coming from an experiment from Dr. Wells. I love Barry's backstory where his father is in prison for killing his mother and I instantly recognised those two sidekicks from a couple of ARROW episodes, it's starting to piece together nice and neatly. As much as I prefer the heroes identity to stay hidden, I was more than happy to see Joe in on the secret, mainly because I've watched many stories where the cops turn the heroes into vigilantes and we have to go through the process of them finally realising that the heroes are indeed heroes. The ending was magnificent in that we saw Wells could move without his chair and then he gets to look into the future. 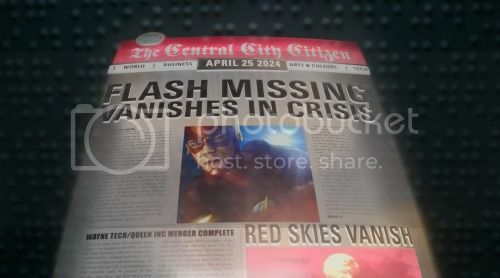 I also loved the nod to Batman & Arrow in the bottom left corner of the newspaper. Although this is set almost 10 years into the future - are they predicting ten seasons like SMALLVILLE? Forgot to mention how I really enjoyed the surprise of seeing Oliver turn up, his name wasn't in the opening credits and that gave it a better impact. Also liked how they both said cool when they saw what each one could do. Arrow doesn't have that tongue in cheek humour and i think that's what I liked most about that scene. Yes, it's much closer in tone to Smallville than Arrow, though I find Flash more exciting and action packed than Smallville. Well, time is very flexible in The Flash. Arrow doesn't have that tongue in cheek humour and i think that's what I liked most about that scene. I like the way the Arrow characters are portrayed on The Flash. They are a bit more relaxed in some ways. I'm starting to sense a 'feel-good' factor in this show. 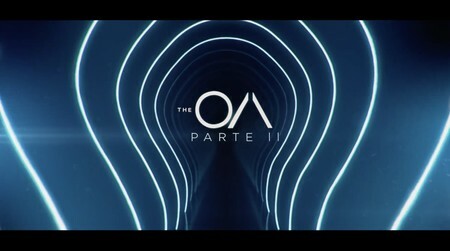 The second episode saw Joe give his full support to Barry and also showed him say that he will do whatever he can to uncover the real truth about Barry's mother. No, I hadn't watched (or were even aware of) the first Flash TV show, but I'm constantly impressed by how these actors keep appearing in the DC universe of TV and movies. I'm starting to sense a 'feel-good' factor in this show. I felt that way about the show when I first started watching it, but I don't feel that way about it now. I can't figure out if that's because the tone has shifted or if I've just gotten used to the original tone. There's definitely more humor on The Flash. Supergirl's tone is lighter still. The secret rooms/areas that Dr. Wells has is so my thing, I love the mystery begin it all and the prison they have set up is awesome. One thing that I can't get out of my head, when do they feed these prisoners? This current episode (Power Outage) is fantastic! There's some kind of elctro man running wild at Star Labs and I think he's just killed Tony, the guy who changes to metal. Barry doesn't have any powers, and all this is happening while Tockman is holding Joe, Iris, Eddie and other cops hostage. And where do they pee? The Man in the Yellow Suit was interesting, but I lost the plot at the end when it looked like Wells was the Yellow Suit guy, only because he was in the same room as him. Whoever this Yellow Suit is, he really poses a threat to Star City and I'm looking forward to seeing where this goes. I really love how this show is starting to spread its wings a little. Having a genius like Wells working with all this technology, while secretly playing villain to what lies ahead. Iris is a great distraction for Barry, while her real love lies with Eddie. Barry is just too good to be true, but will he find true love....? I don't think I ever think of Eddie as her real love. She loves him and he is a good guy, but I feel like Barry and Iris have to be end game. Barry is just too good to be true, but will he find true love....? did they deliberately make Miller's character like his one on Prison Break? I don't think I ever think of Eddie as her real love. Ooh... I've not had that vibe yet. I really wanted her to dump Eddie, but then he started to grow on me a little. Both characters are very calculated and plan every move to almost the second. Whenever Schofield (PB) is in trouble, there's always another plan ready and waiting. Maybe it's just because I've read too much about things that happen in the comics. I like Miller's take on Captain Cold and I like Captain Cold's relationship with Barry. There are times in the STAR TREK universe where science just completely baffles me and I'm feeling it now with The Flash. Someone called Thawne (played by SCANDAL'S Matt Letscher) has just appeared in a flashback, but I think he's from the future and totally confused me. This won't harm my viewing as I learned to just go with the flow during STAR TREK. What it has done is excite me more because even though I don't understand this advanced technology, I absolutely love the thrill of it.